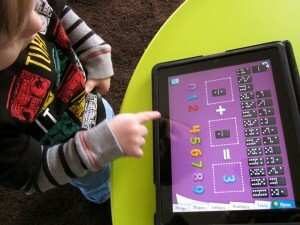 We will be reviewing the many iPad apps Jax has been trying out recently. The iPad is great for car rides and waiting in restaurants. 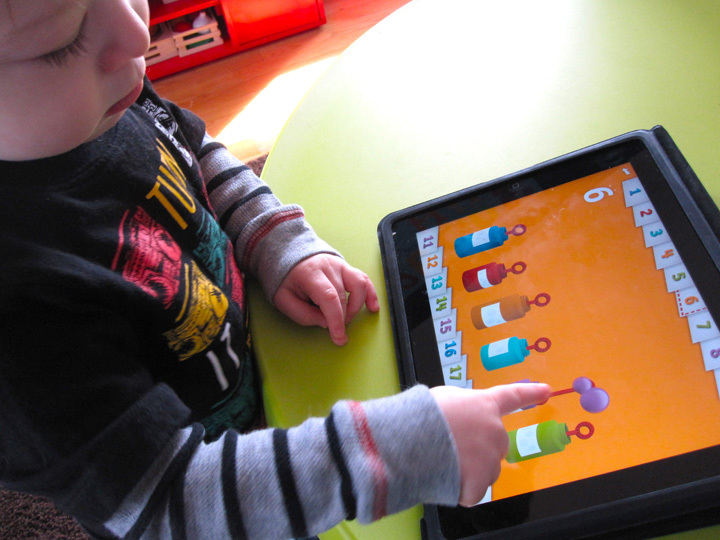 I stick mostly to educational and pretend-play when choosing apps for him. 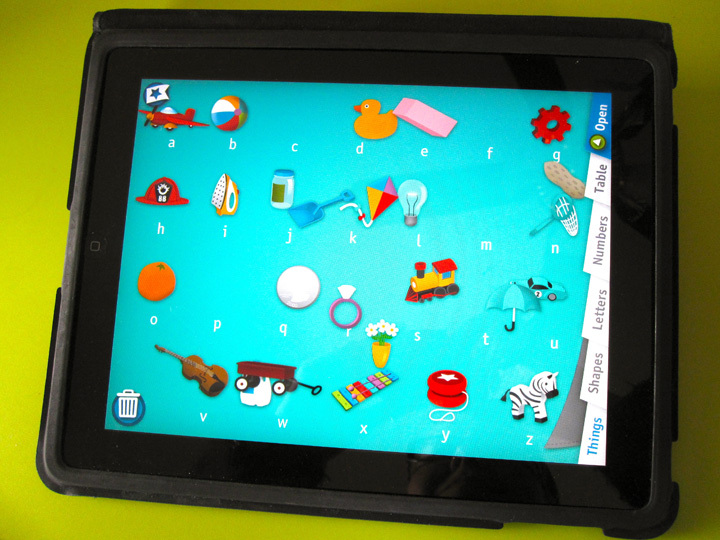 We are giving away one of each of these iPad apps! See below for details! 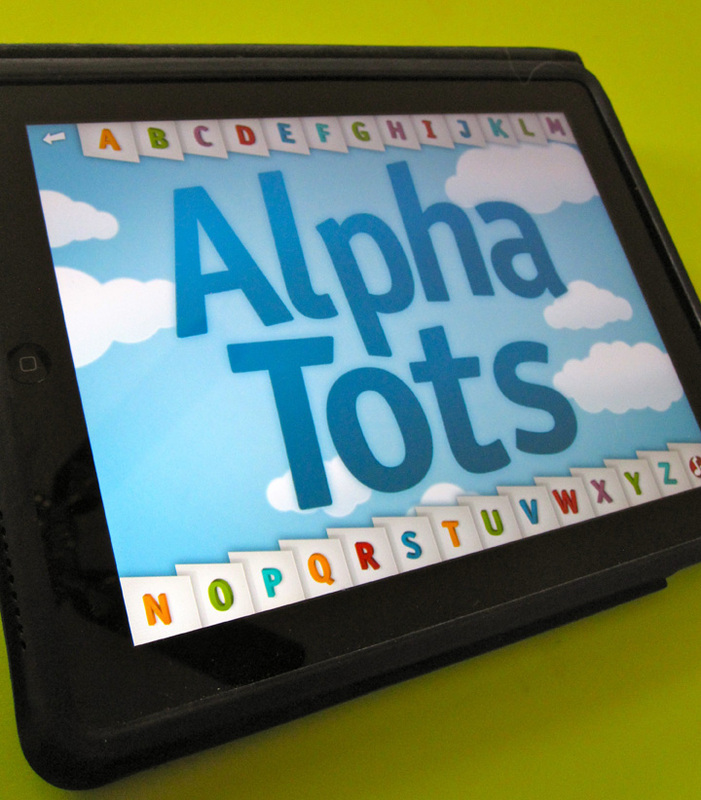 We have had AlphaTots and TallyTots on our iPad for quite a while now. I was really excited when I found then because Jax was just starting to get into letters and numbers. 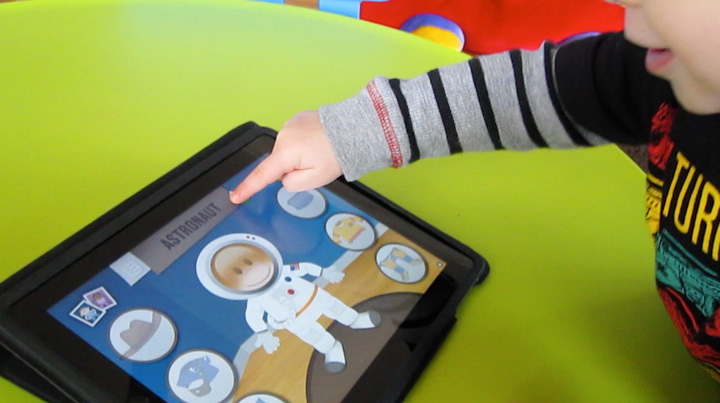 When Spinlight Studio contacted me to try their other apps, TableTots and Swapsies, Jax and I were happy to oblige! 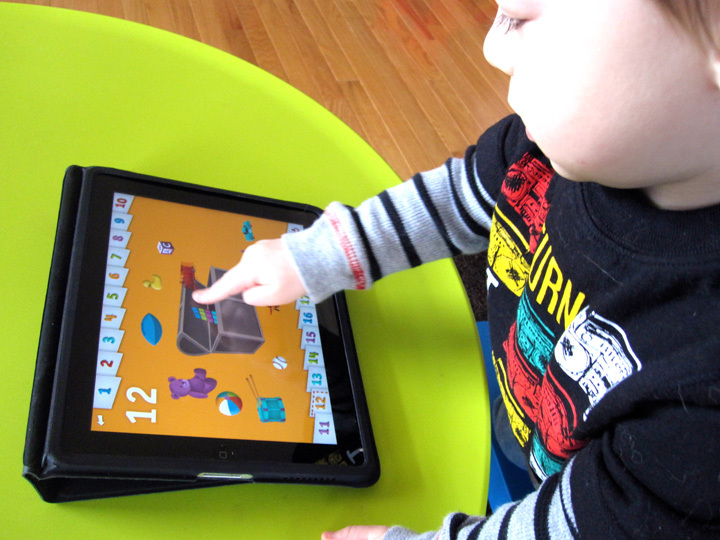 Don’t purchase TableTots thinking you are buying an educational game – you’ll be disappointed! Think of it as an educational tool. Imagine buying a bunch of learning placemats and all the shapes, letters, numbers, coins and more that go with them (with the added bonus of no little pieces to clean up!) 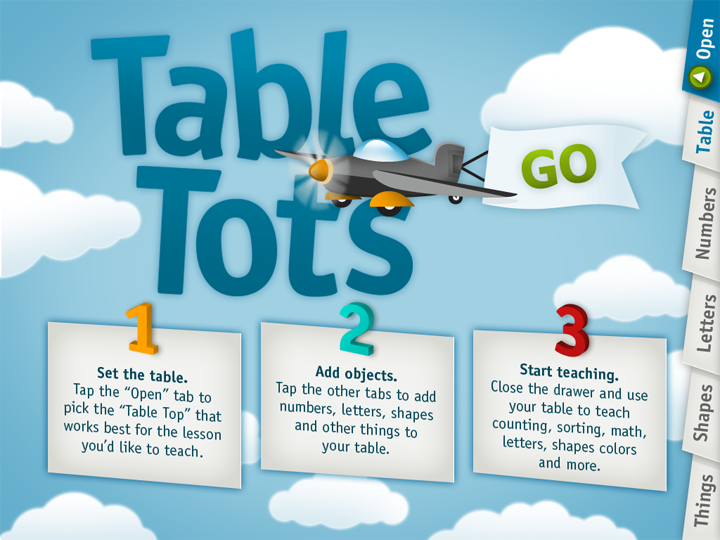 That’s TableTots! Jax just turned 2, so some might say he is too young for a teaching tool like this. But he adores letters and numbers and I am teaching him every day while he is so enthusiastic. Because he is so young, I do let him free-play with the app more often than when I quiz him with it. He chooses the board and the pieces, and I’ll ask him to find a letter or count the coins. He loves the dominoes and it has become one of his new favorite words. This app is helping me teach him to count objects and associate quantity with the numbers he has already learned to recognize. Later on we can move on to simple math, spelling and learning about money. But, even just with free-play, he learns so much because the objects all say what they are when he touches them. What would I change? 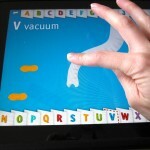 My biggest gripe is there is no multi-touch. 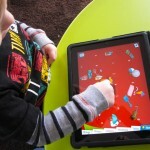 This is an app a parent/teacher and child play together, yet only one of us can move an object on the screen at a time. I also don’t like how the pieces are randomly tossed on top of each board, covering up the writing. It makes it hard for Jax to understand that he should sort objects into their correct places. It would be nice if there were color names. There is a screen that give you a circle of every color to lay out in a color wheel, but when you touch each one, it just says “Circle!” There is a “peek-a-boo” curtain that can be dragged across the screen that I don’t really understand, but that can be turned off. 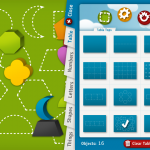 I think TableTots would be a great buy for anyone who does preschool learning with their child, whether informally or as a part of home schooling. 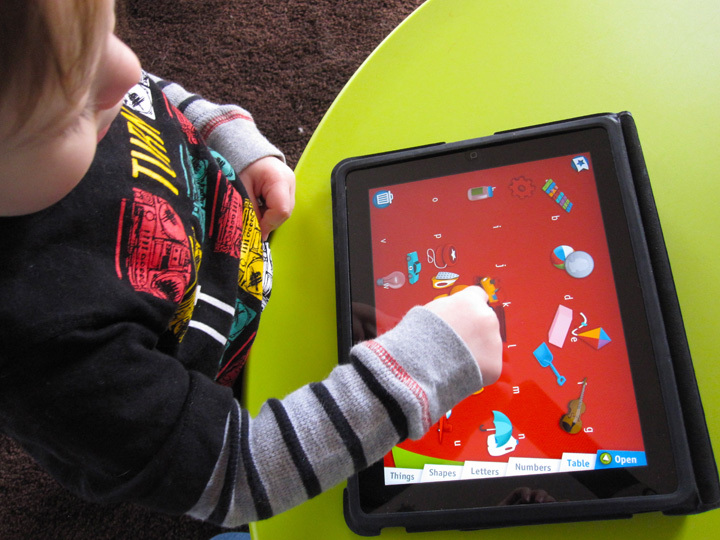 This is an app that parents and children play together, and it is always great when you can combine learning, technology and time spent with your child! 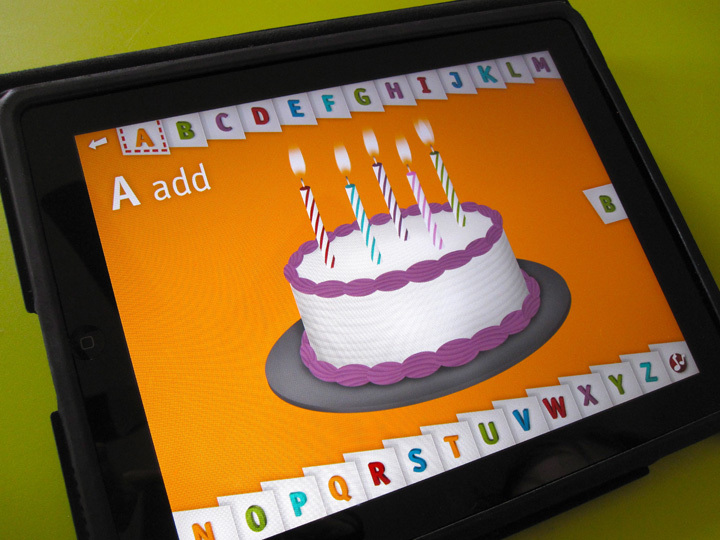 AlphaTots is a great interactive alphabet game. I give this app a lot of credit for Jax learning his ABC’s so quickly. 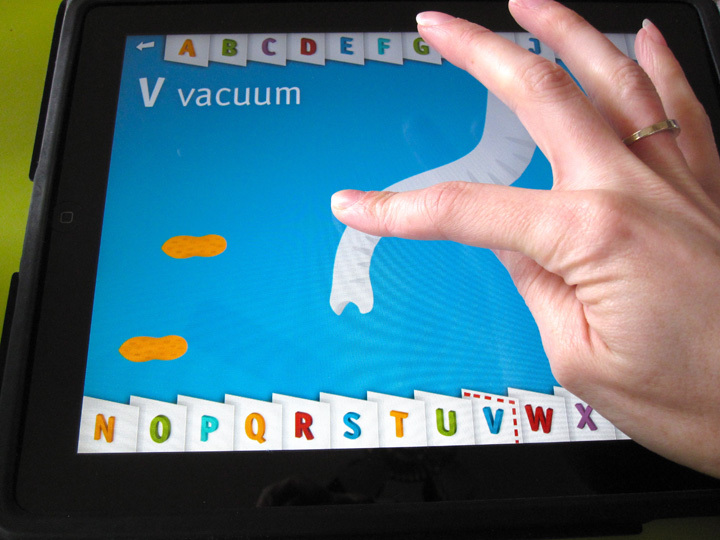 What sets it apart from similar apps is that each letter is represented by an action, not an object, so you don’t have the same old “xylophones” and yo-yos”. Instead, you “x-ray” some presents and “yank” on a cord to fill and empty a tub of water. TallyTots is very similar, but deals with the numbers 1 – 20. Jax has learned all those numbers, though he has trouble counting on his own past 13 just yet. This app has unique activities for each number as well. Jax loves to build sandwiches, feed flies to the frog and look at tiny cupcakes under a magnifying glass. 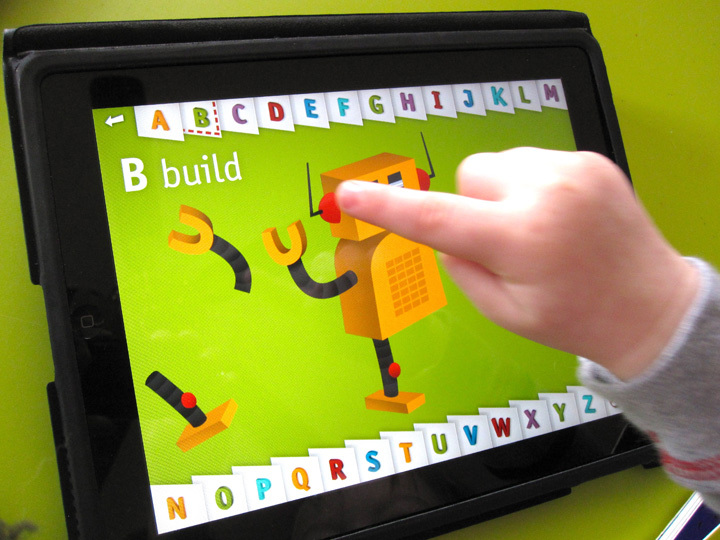 When you choose a letter, They tell you its name and the sounds it makes, then you are presented with an activity. When you complete the activity, you can move on to the next letter. You can also switch to a different letter by pressing an holding one of the letter tabs until the meter fills up. This is a great feature because it prevents clumsy hands from bumping a tab and switching letters accidentally. It doesn’t stop Jax from navigating the app. He quickly figured out how to do it. What would I change? Not much – just the stability of both apps. 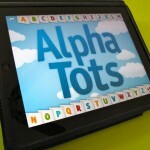 We have very few problems with our iPad 1, but AlphaTots and TallyTots are our number 1 crashes. Jax learned to say “sorry” because they were crashing so often and that is what I’d always say to him. AlphaTots likes to crash most spectacularly: it freezes on the loading screen for a minute or two, then the whole iPad reboots. Yikes! The frequency of crashes tends to change whenever they update the apps, and it seems like it is happening a lot less often right now. 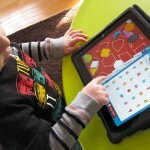 Crashing troubles aside, I would definitely recommend these apps for toddlers! With so many activities per app, Jax never gets bored. He picked up on his letters and numbers so quickly and takes pride in getting them correct. I think Jax’s favorite feature of both games are the songs. He loves to hum along and dance around. 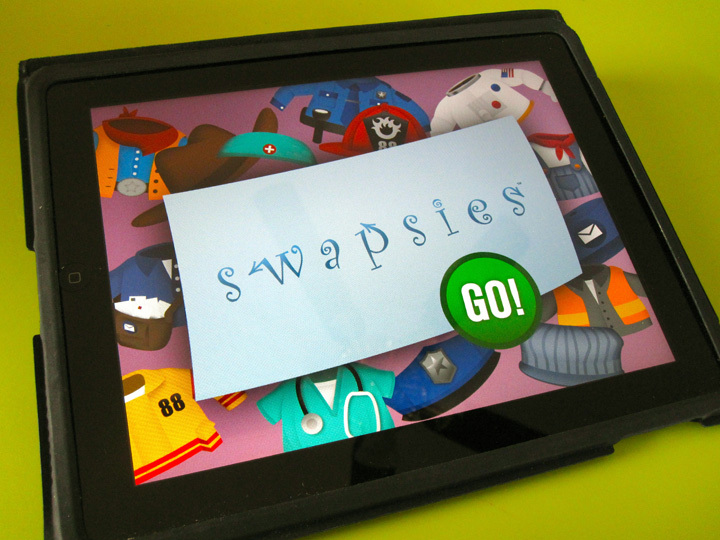 I’d seen Swapsies in the iTunes App Store before but had passed it over. I just didn’t think Jax would be that into it. And, so far, he isn’t. We have a sticker book game with a page of both boy and girl dolls that he enjoys dressing – especially putting glasses on them! This app is different. It isn’t free-play, but matching. I think it’s a great idea, but Jax hasn’t really latched on to it yet. You have your choice of a few boys and girls and buttons for three items of clothing: hats, tops, and bottoms. The clothes are all typical “what I want to be when I grow up” outfits. Police officer, astronaut, train engineer, etc… While gender neutral, they all tend to be masculine. To play, you drag an item to the boy or girl and if you complete the outfit, a little button appears to play a reward sound. Jax thinks the sounds are funny, but they haven’t been enough incentive for him to match the outfits himself. What would I change? The interface is a bit awkward. The clothing choices are presented in three round buttons which make Jax think he should press to choose them, not drag them to the body. This quickly frustrates him and makes him lose interest. I think if there was more of a celebration when a match is made, he might better understand the goal of the game. Perhaps a gallery of all the completed outfits with a word/audio telling what they are. Jax just doesn’t instinctively know what a mail carrier or “rancher” wears. As with all apps I get that Jax isn’t into, it will stay on the iPad just in case he likes it later. This has happened more often than not! I don’t think we would have bought this one, but it could be fun for a child who is into what they want to be when they grow up. The graphics on all of Spinlight’s games are cute, crisp and colorful! 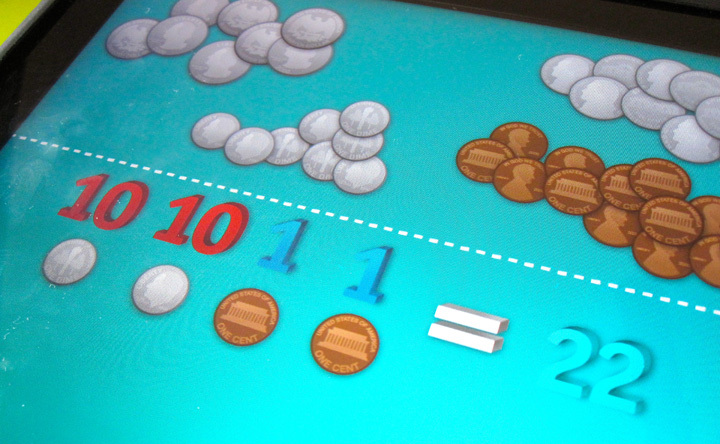 I love when my son’s favorite games are pretty to look at, in addition to being educational. Their apps are available in both the Apple App Store and the Android Market for Android devices. They are currently on sale for 99 cents each! 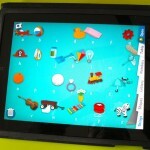 Would you like to win one of these great apps? Jax & I have four free app codes to give away (one for each app) to four lucky winners. To enter, leave a comment on this entry. 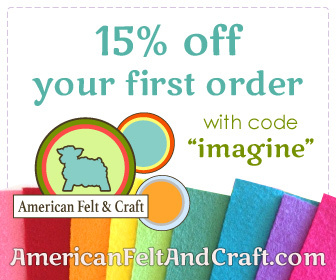 Four random winners will be chosen at noon on Monday, February 13th. Each winner will receive a code good for one of the above apps (my choice, as I only have one of each.) Good luck! Full Disclosure: We purchased AlphaTots and TallyTots ourselves. Spinlight Studio provided us with free copies of TableTots and Swapsies to review and a copy of each to give away. This review is my own, honest opinion. 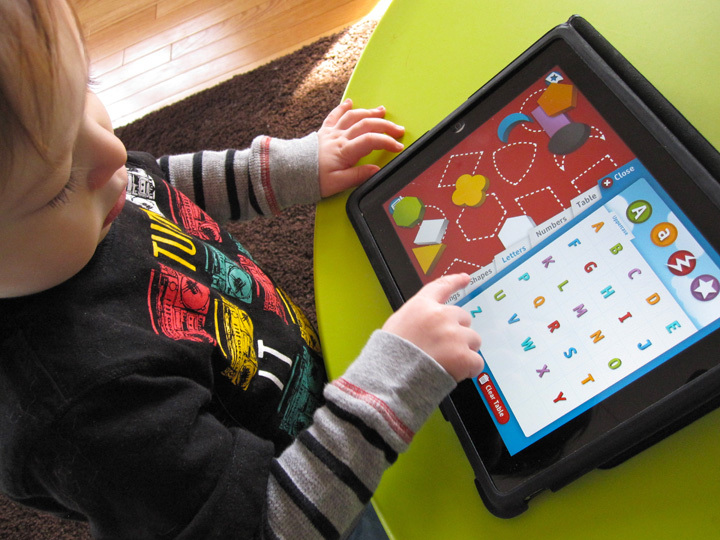 If you have a toddler or preschool app you’d like Jax and I to review, please contact me with details. We have an iPad 1 and an iPhone 4. 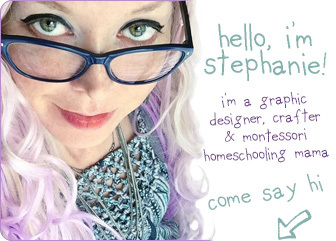 This entry was posted in Giveaways, iPad & iPhone Games and tagged App, Giveaway, iPad, Reviews, Toddler on February 10, 2012 by Stephanie. At 8 months old Daniel already loves my iPad! I would love to win one! Thanks!! Love your reviews. My 23 month old is not nearly as advanced as Jax but we love puzzles and flashcards. He watches as I do Monkey Preschool Lunchbox. I figure he is learning by watching me do it and talk through everything. I haven’t heard of these apps before- thanks for the review! 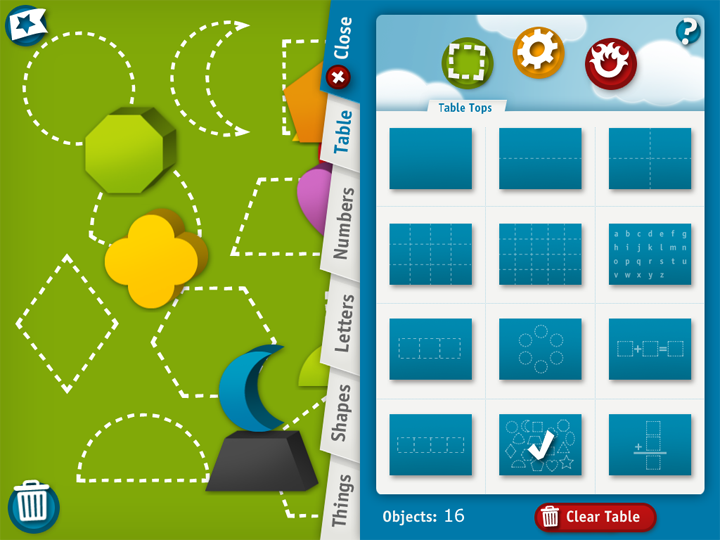 I think my 2 yr old might be interested in the TableTots game! Awesome reviews, I would love to win one of these for Nico! I haven’t seen any of these apps yet. I’d love to win one for my 21 month old! It’s amazing how much they learn on these apps. These look really cool! I’d love a chance to try them out with my 2 year old! My son turned 2 in January and he loves playing with my iPad! This would be a lot of fun for him!